Well, really, what choice did they have? This wasn’t about salaries, by the way. The vast majority of the VFX people working on this project were donating their time. The problem was simply one of equipment. VFX shots don’t render themselves! They require computers. Those computers need software (and electricity, of course!). That software must have licenses. As you can see, the price-tag could shoot up VERY quickly! 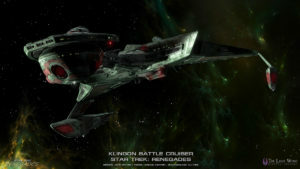 Also, there were FOUR separate teams working on the project: the core Renegades VFX team in Hollywood led by Chris Dawson, the 3rd Division team of five designers in Hollywood led by Yoshi Vu, NEO f/x’s Michael Struck in the Pacific Northwest, and The Light Works team in Cologne, Germany led by Tobias Richter. This is the same noble goal of other fan-productions such as Starship Farragut, Star Trek Continues, Phase II, and Axanar to name a few. Ironically, many of the visual effects artists working on Renegades work on other productions as well. 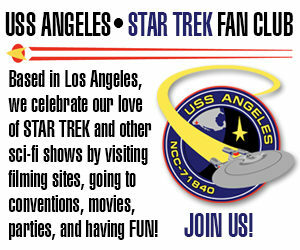 So it is important to realize that if you enjoy these other versions of Trek, contributing to this fundraiser may indirectly benefit your favorite production as well. The hardware and software we purchase from this fundraising effort can be utilized on those films. Seems like a solid sales pitch to me! Although they set their initial goal to only $25,000, they listed stretch goals out of the starting gate up to $100,000…including cloud collaboration storage, additional workstations and upgrades, better compositing software, render farms, and even paid professionals specializing in certain kinds of VFX. Ah, but that was just a wish list. And it wasn’t that fans were getting tired of donating to crowd-funders or that they were running out of money. Less than two months after Renegades failed to reach their $25,000 VFX goal, Axanar Productions would release Prelude to Axanar and go on to raise $638,000 in a Kickstarter. Indeed, this is pretty much where what CBS later called the fan film “space race” began. 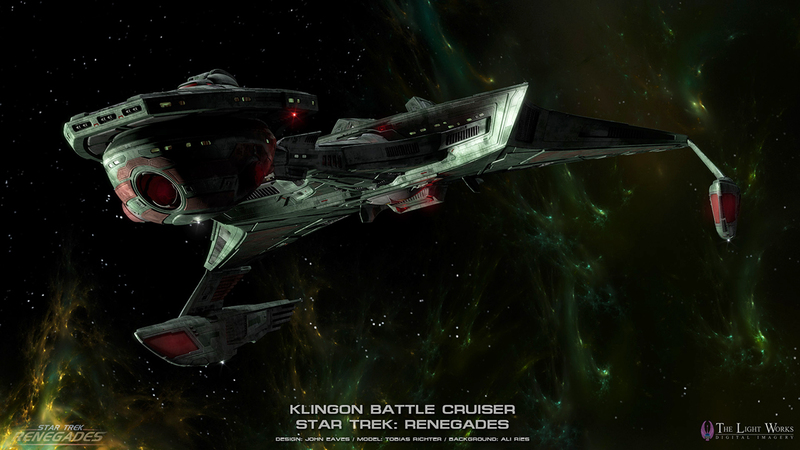 Star Trek: Renegades had launched Trek fan films into orbit with nearly $400,000 in crowd-funding…ten or even a hundred times more than most Trek fan films had been spending up until then. Even Star Trek: New Voyages/Phase II only rose into the five-digit budgets for most of their episodes. But here was Renegades blasting through that ceiling in 2013…and then in 2014, Axanar would blast through that to the new HIGHER ceiling. And in 2015, both Axanar and Renegades would have new crowd-funding campaigns with totals in the $400,000-$500,000 range. CBS and Paramount were growing concerned, but more on that next week. At this stage, the film will be color-corrected, have the full music score, sound effects, etc. – all but a few very complicated effects shots. The VFX shots which are not completed will have animatics – simpler 3D-rendered effects shots in place of the finished ones. Our VFX department is working tirelessly to complete all the visual effects for the film. We have a grand total of 637 VFX shots we’re finalizing and polishing – that’s a huge number of effects, comparable to some of the biggest budget films in Hollywood. In comparison, the original Terminator and Star Trek: The Wrath of Khan barely had 100 VFX shots each! These effects are being done by industry professionals who are graciously volunteering their time for Renegades. We want to give them all the time they need to produce the best film and visuals possible. Renegades has been a monumental undertaking, and we could not have done it without your generous support. It looks like a big budget feature-length film, with a huge ensemble cast that includes 61 actors, numerous new alien species, 26 different locations, incredible elaborate multiple sets (including several new ship designs), and a crew of 170 professionals and enthusiastic volunteers. All this with a budget that is .002 (1/4 of 1%) the amount of the JJ Abrams Trek films! But we know the question on all of your minds – when will I receive my download or DVD/Blu-Ray of Renegades? As much as we’d like to give you a definitive date at this point, that will all depend on CBS. Their response to our film will ultimately determine our final release dates. We are keeping our fingers crossed for good news, and we’ll pass on any developments as soon as we hear them. 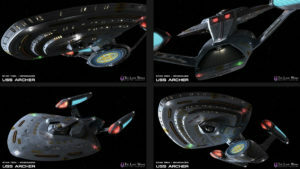 You might have noticed that the team was still hoping to pitch this idea to CBS as a new Star Trek TV or web series. Can you imagine a Trek fan film trying to do that now? A lot changes in just two years! With more and more pieces of Renegades coming together, there was ever more for fans to see as the months of 2015 ticked by. Previously, in November of 2013, fans had gotten their first look at the USS Archer, designed by Star Trek veteran and legendary designer Rick Sternbach, with digital art by Yoshi Vu and final rendering by Tobias Richter. And it looked amazing! In March of 2015, the team announced that out of the 637 VFX shots, only 20 remained to finish. Other visual compositing and color correcting were also being completed. But if just telling fans that wasn’t enough to get them excited, then why not show them, too? Fans were dying to see new footage, and they got their wish in a VERY unexpected way! By 2015, teasers and trailers for fan films were nothing new. But a music video? YES! Producer Sky Conway and director Tim Russ edited together never-before-seen footage from Star Trek: Renegades over a hauntingly melodic ballad sung by Cela Scott, who would be playing the mother of the film’s lead character, Lexxa Singh. The song was based on the poem “Invictus” by William Ernest Henley, which would play a prominent part in Renegades. Other footage for the video of Cela singing was shot on location during filming of a flashback for the fan film. On June 10, the Renegades team provided a 5-day exclusive streaming preview of the nearly-completed Renegades fan film (if the term “fan film” was even applicable anymore…although I think it should be, despite the number of professionals involved, since these were still all FANS). The film still had some temporary visual effects and a temporary musical score, but for all intents and purposes, this was the finished product in terms of scenes and cutting. 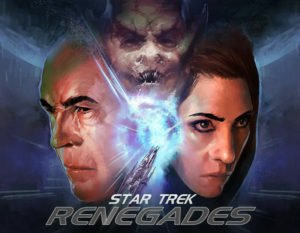 And then the biggest news of all: an actual date and location for the world premiere of Star Trek: Renegades was announced. Rather than simply releasing the film on YouTube (which would happen shortly thereafter), Renegades would first have a gala red-carpet premiere at the historic Crest Theater in Westwood, Los Angeles…a place where many of the big Hollywood red carpet premieres happen. This was major! Now, I can’t say that “no Star Trek fan film had ever premiered for the first time in an actual movie theater before” because Prelude to Axanar had made its debut at San Diego’s Horton Plaza UA Cinema a year earlier. (Remember: “space race!”) But Prelude was a 21-minute short film made for about a hundred thousand dollars. Star Trek: Renegades was an hour-and-a-half-long feature and cost four times as much as Prelude. It also had many more Star Trek veteran actors and production crew, and they were all going to be at that premiere. Next time, the history of Star Trek Renegades continues with photos from the red carpet premiere, the hiring of a lawyer to take them to meet with CBS, and a reaction from the studio (months before Axanar was sued) and also from Trekkers in general. Here’s a new one for yah! I’m multitasking Star Trek today, total immersion. Or, would it be better referred to as Geeking Out? Previous Previous post: New fan series ENDEAVOUR releases its debut episode “The Gift”! Next Next post: STAR TREK CONTINUES revises the RELEASE DATES for its final two episodes!